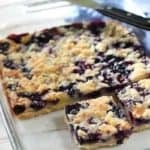 Easy Blueberry Pie Bars! – If you make these once, you will make this a hundred times! Made with fresh and easy ingredients, your family will love these! 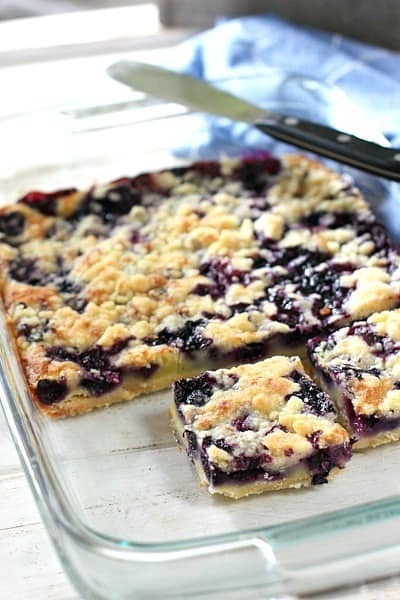 But it’s okay because we have Blueberry Pie Bars! I love getting older, some day I’ll tell you all about it. The aches, the pains, the urge to watch Let’s Make a Deal. And when did Bob Barker get so hot? Such a simple recipe. You mix up a standard quick crust of flour, butter etc. 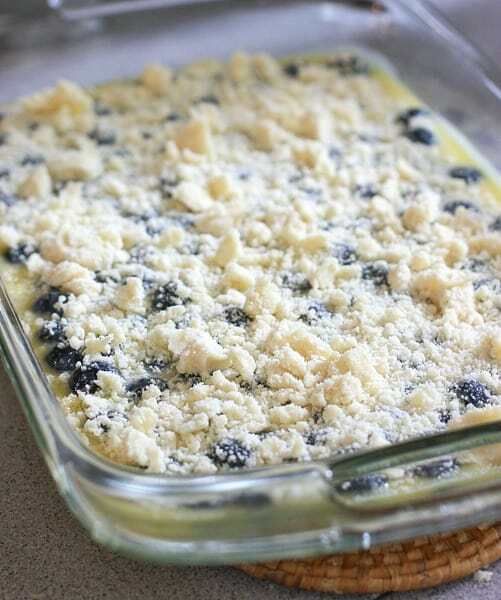 Remove one cup before pressing in the bottom of pan, to use for the crumble on top. (I am giving you a visual of this so you don’t forget this step… I am old. I always forget this step). Mix up your filling ingredients that include eggs and sour cream …yes sour cream! How clever is that? Us oldies, we got the secrets! Top with that cup of crust mixture you saved, and bake. I used fresh blueberries but you can substitute frozen, just don’t thaw them. Use them frozen or you will have a big blue mess on your hands. It will still taste good but it won’t be pretty. I like pretty. How about this beautiful Orange Bars! There are Cherry Pie Bars too with easy step by step instructions! 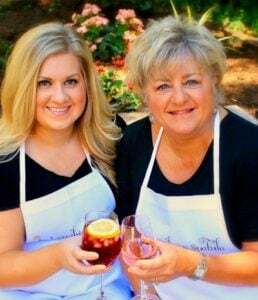 To ageless easy recipes and the people who make them! 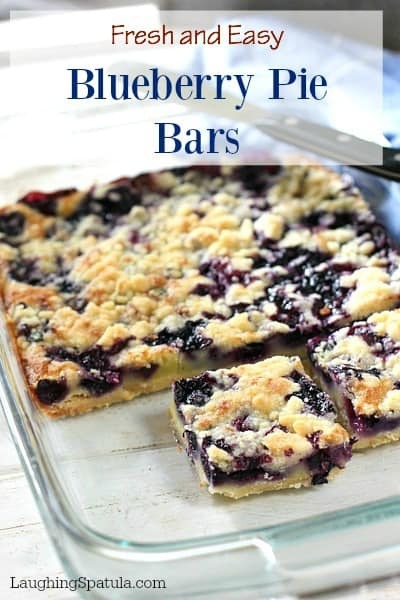 Blueberry Pie in a bar! One pan easy! Spray a 9x13 glass baking dish with non stick spray - set aside. 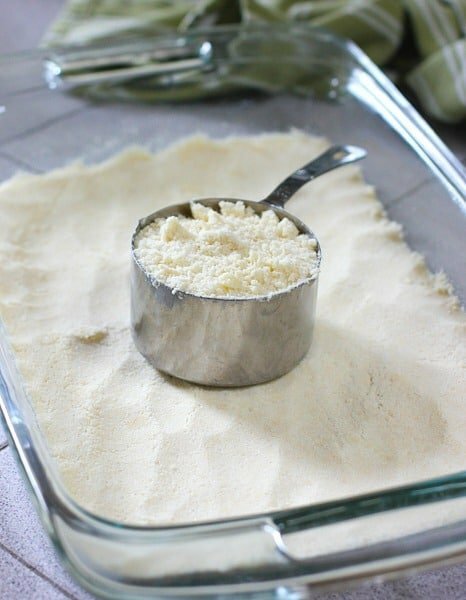 Remove one cup of flour mixture and set aside. Take remaining mixture and firmly press into your baking dish, covering the bottom. Gently fold in blueberries. (if using frozen, do not fold in blueberries until you are ready to pour into prepared pie crust to avoid your batter turning blue). When crust is ready - remove from oven and add filling. Gently spooning over the top of the crust. Sprinkle with remaining crust mixture you had set aside. Hi, you have “filling” in your ingredients, what is the “filling”? The ‘filling’ are the ingredients that follow the title ‘filling’ :). I updated to be clearer. Thanks! Thank you. I thought I was missing something. If I were to make these and cut the recipe in half and use an 8 by 8 square pan would I bake them shorter time? Thank You! Just in time I need to use my blueberries. These look delicious! Hi Debbie – yes that is correct. Sorry you had problems with the recipe! Could your oven rack be on the lowest rung? I make this regularly and have not had it burn. Hi Kathi! Do you think I could substitute store bought pie crust? I have one already in the fridge and thought maybe I could use it, but I’m not sure it would “crumble” the right way. This recipe looks and sounds delish – do you have a gluten free ? I know when substituting almond flour and coconut flour the proportions are a bit different, just wondering if anyone has tried it. Here in Oregon blueberries are IN! Hi Libby – I think for this recipe, almond flour would work. Only because it’s a crust, not a cake. I have not tried it, want to be clear on that :). It would just be more of a nut type crust. If it feels to dry then add a bit of fat like butter or coconut oil to it until it gets to a consistency where it can be pressed into the pan. Hope that helps…let us know please! Thank you for this recipe! I am not a baker, this was simple and delicious!! Blueberry season! These bars are so yummy. I would like to experiment on making them healthier, less carbs, any seggestions? Hi Melinda – with only a 1/2 cup of sugar there isn’t a lot of carb wiggle room on these. You could probably reduce that by a few tablespoons without too much damage but these are not overly sweet. You could sub half the flour for almond flour as well. Love to hear how they turn out! Have you tried to make this with whole wheat flour? This was awesome and very easy. I used the food processor to mix up the crust ingredients. Think I may try subbing peaches. I’m so glad you liked them! I think it would be great with peaches! I worry a bit about too much juice. Maybe toss the peaches with a little flour before mixing into the sour cream mixture? Would love to know how it turns out! Do you think if I substitute the sour cream for cream cheese it would be good? Just wondering if anyone has done this! And do you think it would be ok to add some pecans to the topping ? Hi Debra – It would be really thick, like a cheesecake. Would probably work but I havn’t tried it so can not recommend. Try to use the sour cream if you can…it doesn’t taste like sour cream when all baked together if thats a concern for you.